As a growing business, you understand the importance of driving traffic to your website. More website traffic means more leads, opportunities for engagement, social media sharing, and ultimately the chance to convert leads into sales. No doubt, you would’ve encountered several articles highlighting a variety of ways to increase traffic. These include – among others – maintaining a consistent blogging schedule, producing highly relevant and targeted content, ensuring social media integration, tweaking your SEO, building links, maintaining a responsive website and monitoring Google Analytics to understand your market in great detail. Let’s look at 8 Apps that do a combination of the above to help you boost traffic to your Weebly site. All these apps are available in the Weebly App Centre. Not only will Swell boost your website traffic, it will help you build your social media following, create an engaged audience, and drive sales (if you have an online store). In a few simple steps, Swell can create your own custom reward program that’s linked across channels (think social media campaign combined with a follow-up e-mail). Customers are rewarded for following you on social media, sharing content on Twitter and Facebook, reading a blog post, purchasing from your store, signing up for your email newsletter and more. Visitors can collect reward points by simply visiting your website. 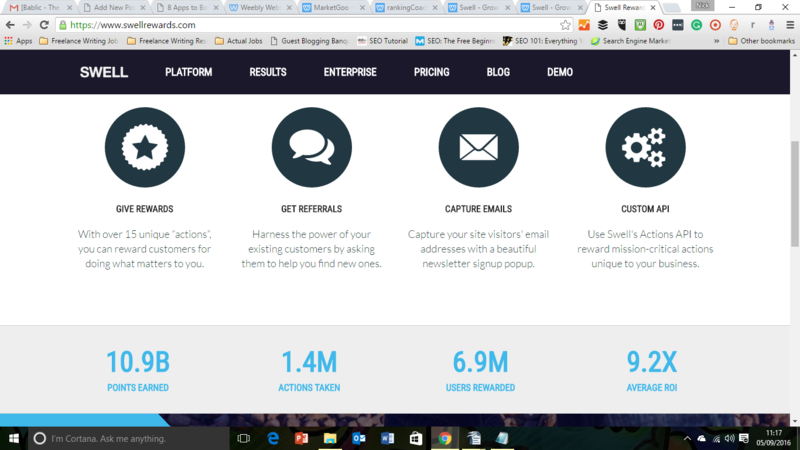 Signing up to use Swell is simple and you’ll also have access to numerous marketing tools. For an example of a website using Swell, visit Babies at the Barre. Their pricing model is designed for your growing business. You can, at no cost, run up to 10 campaigns. More advanced features are available for a monthly subscription, starting at $49. If you’re not tech savvy or lack SEO experience, Market Goo is perfect for you. This SEO and web marketing tool is simple, yet packs a punch! Follow simple steps and tasks to improve your position in search engines. With the web marketing tools, you can monitor performance and see how you’re doing in comparison to the competition. You’ll be notified via the smart app when something of importance happens on your site. You can sign-up with a plan starting at $19.95/month for one website, or an agency plan at $79.80/month for 5 websites. To increase your Weebly website visibility in search engines, use Site Booster. By following a few simple steps, Site Booster ensures your business details are listed – and monitored – in places that matter such as major search engines and leading business directories. The app also integrates with online maps, review sites, Pinterest and WhatsApp so potential visitors can find your location and more. With a free plan, you’re given two listings and for a mere $6.99/month you get Top-Tier listings. Better Coupon Box drives traffic to your Weebly site by offering visitors a sweet deal. You’re able to create a powerful call to action, in the form of a pop-up Box that offers visitors a discount. With the ability to integrate seamlessly with social media channels you can also offer discounts and unique codes to customers if they follow you on Facebook, Twitter, and Pinterest. Better Coupon Box then, is a great tool to build your fanbase. Effortless integration with e-mail marketing services is also available. Visit Dharma Yoga Wheel to witness this in action. All of the above is free. Ranking Coach, is for the business owner with a limited budget, but still requires powerful marketing techniques. Ranking Coach allows you to market online. It’s the app for DIY marketing. The local directory scanner ensures business listings in all notable business directories. It will help you with SEO, track Google rankings, monitor competitors rankings, and other online metrics. Try it for free for 14 days. Thereafter it’s $14.95/month with an opt-out option. Additional features include – among others – mobile compatibility, full customization options, ability to post a message and news, Twitter share button, bulk e-mail download and the capability to link to other pages. All Weebly themes are supported, aside from Stripes and Oasis, with the following notable exceptions: (1) with Clean Lines, only the bottom bar is supported, Lucent, the top bar and Dusk and Unite, the bottom bar in mobile. There is a free plan or a monthly fee of $3.99 for premium features. With over 1 Billion users on Facebook, Facebook advertising is crucial to building an online presence. PagePart AdVisor helps you place ads and reach your customers on Facebook. With PagePart Advisor you’re able to run simple, yet targeted ads, directly from your Weebly Dashboard. There are guided prompts and pre-defined templates to assist you in ad creation. Product information is readily available through integration with your Weebly store. PagePart will deliver the ad following your choice of customer (according to interests, location, and demographics). Following launch, your campaign is tracked to ensure your expectations are met. The pricing plan is fixed, starting at $45/month. Positionly allows you to grow traffic through providing simple SEO tools. The cloud-based software solution takes professional level tracking tools and displays it simply on a user-friendly dashboard. Features include daily rank tracking, keyword analysis, ability to see who’s linking to your site and competitor observation. You can sign-up for a free 14-day trial, after which plans range from $15-$499 depending on desired features. 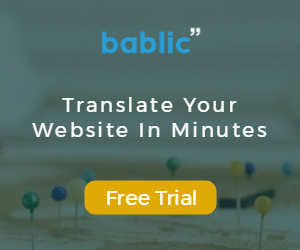 Make sure to also check out the Bablic Weebly app in order to easily translate your Weebly website and grow your traffic by catering to new audiences and markets. 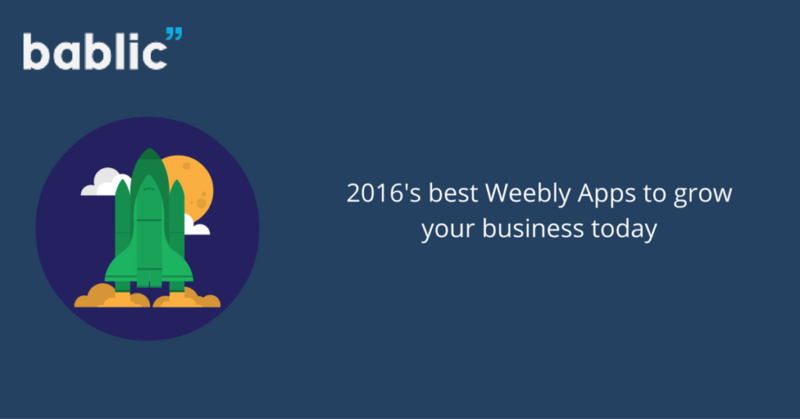 These 8 apps are powerful tools to drive increased traffic to your Weebly site. To download these or see more, be sure to visit the Weebly App Centre.